Results of a fresh research conducted in Denmark have just scientifically confirmed something that many of us already know: Spending too much time on Facebook can strip us of our happiness and make us worry more. And apparently, this stems from one new psychological susceptibility or predisposition in this Digital Age called "Facebook Envy". Facebook Envy stems from FB users' tendency to compare what's actually happening in their lives with the filtered - and sometimes heavily glossed up - information that their friends share on social media. "When we evaluate our lives, we are influenced by social comparisons. How am I doing compared to my peers? [...] Instead of focusing on what we actually need, we have an unfortunate tendency to focus on what other people have," shares The Happiness Institute - the group behind this study. Comparison, as the wise ones say, is the root of all unhappiness and stress. Instead of being grateful for our own gifts and blessings, we stare at the photos of our buds on Facebook and imagine all the good things that must be happening to them that we can only hope to experience in our lives. As a result, we feel sad and we worry more about our future -- all without realizing that 61% of users prefer to post only their good sides on Facebook and 69% have the conscious effort to only post pictures of the great things they experience. 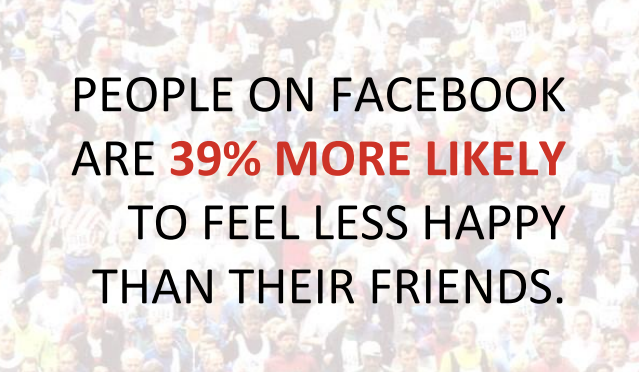 Those are just two facts that The Happiness Institute was able to uncover after conducting their 'Facebook Experiment' on 1,095 random research participants in Denmark. They also found out that Facebook users are 39% more likely to be unhappy and 55% more likely to be stressed compared to those who aren't on the site. 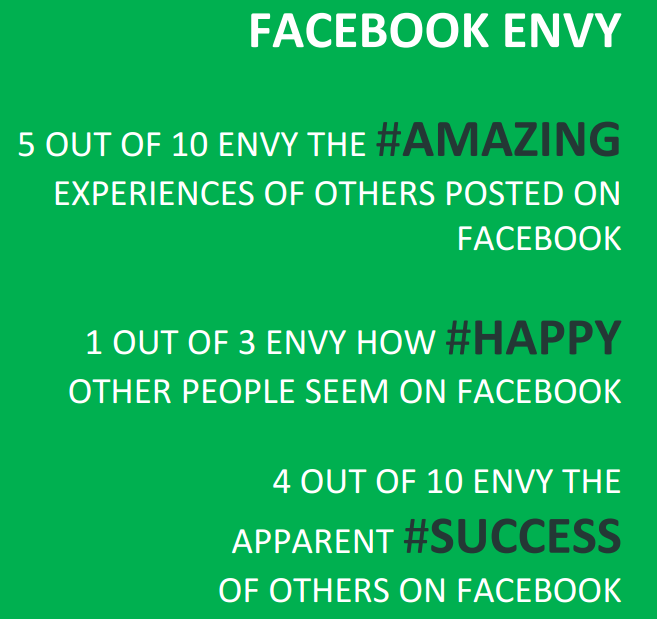 So how do we address 'Facebook Envy' and reclaim our happiness in this social media era? The answer is easy -- and it couldn't be more obvious. We simply need to limit the time we spend on that social networking site. The meat of the research proves just that -- and likewise presents other amazing benefits. In the experimental study, THI wanted to test if Facebook use affects our subjective well-being. So they randomly divided all participants to either: 1. The control group (continue to use Facebook as usual) and 2. The treatment group (no Facebook use for an entire week). After one week, THI asked all of them to re-evaluate their lives. Now, I don't know about you, but I think these findings are totally inspiring and eye-opening. But the question is: How soon can we give up Facebook? Or better yet, can we actually give it all up at this point?